YearOne sure throws a great party, regardless of the weather! For the fourth straight year, ace designer and car builder Foose teamed with well-known muscle car parts supplier YearOne to host the Chip Foose Edition Braselton Bash. Best of all, all proceeds from the weekend’s various activities were donated to charity. A little background on the event: YearOne holds a monthly series of shows/cruise-ins during the spring and summer at their headquarters in Braselton, Georgia. The proceeds from each show, known as the Braselton Bash, benefit various charitable organizations. YearOne founded the Hot Rodders Children’s Charity shortly after the shows began to facilitate their charitable efforts, and the HRCC then passes the funds along to the appropriate charity or organization. 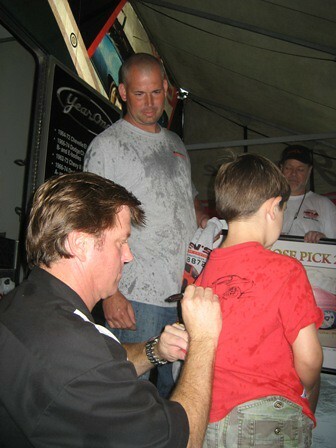 YearOne’s president Kevin King got to know Chip Foose a few years back while participating in various industry functions. Foose has long done work with the Progeria Research Foundation, a charitable organization dedicated to finding a cure for the rare and fatal childhood rapid-aging disease Progeria. 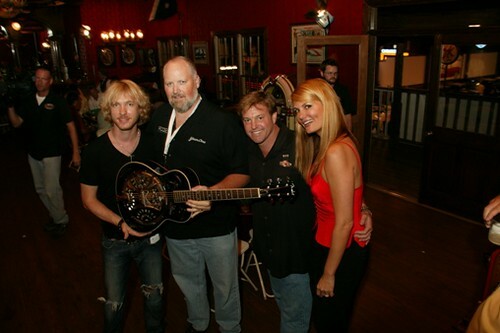 King approached Foose with a plan to hold a special Foose Edition Braselton Bash, with the proceeds benefiting PRF. The first event was held in 2006. The event is much more than a simple show and shine. In an effort to increase industry participation and donations, YearOne came up with a special Friday-night Texas Hold’em Poker Tournament held at the home of Milt Robson’s extraordinary car collection. Milt’s facility is much more than a place to show off his cars, it features a fully equipped and functional western-style saloon up stairs where the Poker playing takes place. Industry VIPs from around the country are invited to play in the tournament, with the winner taking home a suitable grand prize for their efforts. Admission into the game is $1000 a head, which is of course donated to the Progeria Research Foundation. The Bash itself is held on Saturday, and consists of a large, multi-make show along with a special silent auction of various items. The show is made up of two classes – a general show group with a participant-vote best-in-show award, and a special Foose Select Group. The Foose Select Group is limited to 100 cars, and each member gets a picture of their vehicle and themselves with Chip as a souvenir. Additionally, Chip picks his favorite vehicle out of the Select Group with the winner getting a personalized sketch of their vehicle by Foose, and an invitation to dinner with Foose and Kevin King the following evening. While this year’s event was marred a bit by wet weather, the Foose Edition Braselton Bash still managed to raise just over $110,000 for the Hot Rodders Children’s Charity and the Progeria Research Foundation. The event is quickly becoming a tradition within the industry, with extensive magazine and television coverage helping spread the word. For more information on HRCC, the Progeria Research Foundation or the Chip Foose Braselton Bash, visit www.yearone.com. Kyrie Irving‘s had quite the 2016. After returning from an injury that sidelined him in last year’s NBA Finals, Kyrie made the most of getting back to the promised land by having a Finals Cleveland Cavaliers Jerseys for the ages this year, capped off by a game-winning three-pointer to give the city of Cleveland its first championship Lebron James Shoes in over 5 decades. If that wasn’t enough, Uncle Drew then reconnected with Coach K and won a Gold Medal LeBron 10 in the Rio Olympics. Nike Basketball continues to feature the Kyrie 2 in a number of head-turning colorways, and this Kobe AD Saturday, September 24th, you’ll have another option to grab his second signature with the Nike Kyrie 2 Bright Crimson.The Kyrie NBA Stars Shoes 2 Bright Crimson pairs an ominous black mesh upper with a neoprene textured strap and plenty of Bright Crimson speckling Kobe high top throughout. The vibrant contrast pairs perfectly for a flashy aesthetic while a Metallic Silver Swoosh allows for Kyrie’s signature logo Curry 2.5 to stand out. The durable outsole unit designed for quick cuts and slashes to the basket even gets a darker kobe 9 elite than usual icy treatment for a unique twist. What do you think of the latest Kyrie 2? We know how difficult is to make time for writing assignments or completing your reports, especially when you have to meet a particular deadline. That's why we have assignment writing services for students. Enroll now!